The avocado, nicknamed alligator pear (due to its shape and textured skin), is truly a magical food. Native to Central and South America, avocados are loaded with nutrients and healing properties, and are often referred to as the most nutritious of all fruits! The diversity of ways to prepare avocado makes it perfect any meal or snack. Over the years, misconceptions have formed about avoiding avocados due to their fat content. They indeed have a high content of fat – the GOOD type. You need good fats (monounsaturated, polyunsaturated) for your body to function properly – including hormonal balance, protection, energy and temperature regulation! Avocados should not be avoided; avocados are highly nutritious! Avocados contain significant amounts of Vitamin B5, Vitamin B6, Vitamin C, Vitamin E, Vitamin K, copper, potassium, folate and fibre. They are also rich in phytosterols, carotenoids, alpha-linoleic acid, oleic acid, flavonoids and polyhydroxylated fatty alcohols. Research suggests that avocados should be considered for a baby’s first food. Its creamy texture and mild taste appeals immediately to infants. (My sister started her children on avocados and thus began a life-long love of avocados for both of her boys!) Avocados contain more potassium, magnesium, Vitamin B1 and Vitamin B2 per serving than any other fruit or vegetable commonly marketed as baby food. A study published in 2013 examined dietary patterns associated with individuals who consumed avocados versus those who did not.1 The results showed an overall higher intake of fruit and vegetables with those who consumed avocado. Their overall BMI and weight were also significantly lower. The study indicates an overall improvement of health and lowered risk for metabolic syndrome. Avocados also provide a significant amount of satiation : they will make you feel full longer, helping to curb high sugar cravings. Preliminary research is being done examining the anti-cancer properties of avocado extract, specifically in prostate and oral cancers.2 High levels of inflammation and oxidative stress accelerate the risk of cancer forming. Avocado is both an anti-inflammatory and anti-oxidant food. Therefore, avocados are likely to provide a protective effect. In cancer cells, avocado actually increases oxidative stress, causing apoptosis (cell death) and reducing the number of cancer cells. At the same time, the avocado continues to reduce inflammation and oxidative stress in healthy cells, protecting the rest of your body. Avocados are a low carbohydrate and low sugar food. With less than 2 grams of sugar per cup, they are ranked very low on the Glycemic Index (GI) scale. They are a great choice for balancing blood sugar and keeping energized throughout the day. Avocados contain a high amount of oleic acid, a monounsaturated fat which has been shown to lower the risk of heart disease.4 The risk is also lowered by Omega-3 fatty acids, which are found in avocados in the alpha-linolenic acid form.5 Elevated levels of homocysteine increase the risk of heart disease, while B vitamins help regulate homocysteine levels in the body – and avocados have a significant amount of Vitamin B6 and folic acid! Fibre is another important factor in lowering the risk of heart disease. Guess what? Avocados contain about 7g of dietary fibre per cup! 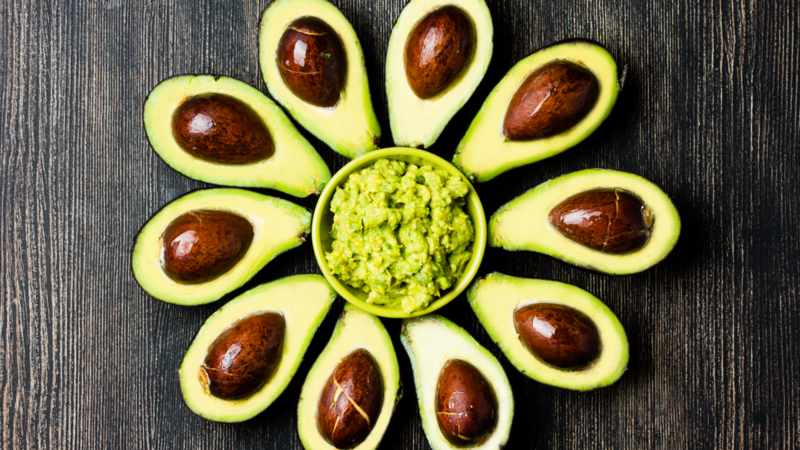 Oleic acid (found in high concentrations in avocados) help your digestive tract form transport molecules for fat that increase absorption of fat-soluble nutrients – for example, carotenoids, which are amazing, free radical scavengers. Research has shown that lycopene and beta-carotene (types of carotenoids) were absorbed readily with the addition of avocado or avocado oil.6 Plus, avocados contain their own amount of carotenoids. The highest concentration is found in the darker flesh, closest to the skin, so, be sure not to cut off that darker green colour! Next time you have a salad, consider adding some avocado to it! One (1) cup of fresh avocado added to a salad comprised of romaine lettuce, spinach and carrots increase the absorption of carotenoids 200-400%! Avocados contain phytosterols that are known to help ease the pain of rheumatoid and osteoarthritis. Avocados contain anti-inflammatory polyhydroxylated fatty acids (PFAs), which are normally found in ocean-dwelling plants, making the avocado very unique. Avocados contain Omega-3 fatty acids which are a vital source for anti-inflammatory responses – and avocados contain approximately 160mg per cup! Go on, get the life you deserve! Indulge in delicious, healing recipes and down-to-earth, easy-to-understand nutritional science. Go on, you deserve it! Get your weekly dose of Juicy Vitality!